St. Paul, Minn., September 9, 2014 PolyMet Mining Corp. (PolyMet or the Company) TSX: POM; NYSE MKT: PLM today reported that it has filed its financial results for the three and six months ended July 31, 2014. PolyMet controls 100% of the development-stage NorthMet copper-nickel-precious metals ore-body and the nearby Erie Plant, located near Hoyt Lakes in the established mining district of the Mesabi Iron Range in northeastern Minnesota. Loss for the three months ended July 31, 2014 was $1.610 million compared with $1.762 million for the prior year period. General and administrative expenses excluding non-cash stock-based compensation in the three months ended July 31, 2014 were $0.955 million compared with $1.283 million in the prior year period. Loss for the six months ended July 31, 2014 was $3.394 million compared with $3.422 million for the prior year period. General and administrative expenses excluding non-cash stock-based compensation in the three months ended July 31, 2014 were $2.197 million compared with $2.406 million in the prior year period. At July 31, 2014 PolyMet had cash and cash equivalents of $16.283 million compared with $32.790 million at January 31, 2014. 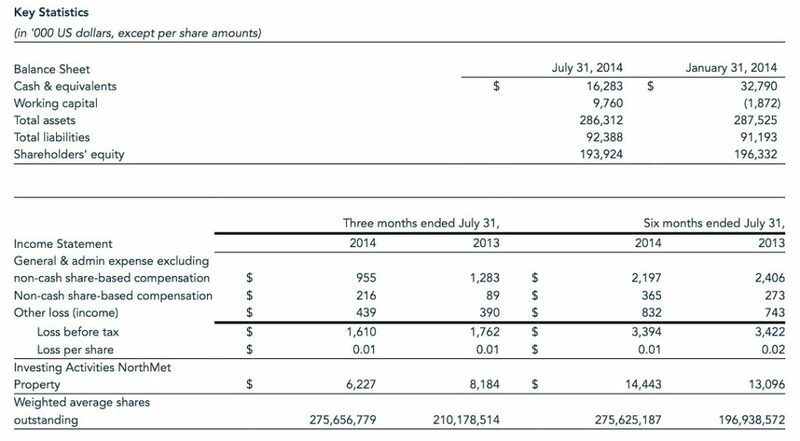 Convertible debt at July 31, 2014 was $32.701 million. PolyMet can trigger conversion of the debt to equity at a fixed price of $1.2920 per share upon the Early Maturity Event. At the same time, PolyMet can trigger the early expiration of share purchase warrants held by Glencore, which, if exercised, would raise an additional $8.6 million at $1.30 per share. PolyMet invested $6.227 million into its NorthMet Project during the three months ended July 31, 2014, compared with $8.184 million in the prior year period. As of July 31, 2014 PolyMet had spent $77.363 million on environmental review and permitting, of which $70.872 million has been spent since the NorthMet Project moved from exploration to development stage.